As the global auto industry prepares to usher in the era of autonomous driving, carmakers are increasingly presenting concept cars with unique exterior and interior designs, breaking away from traditional style. 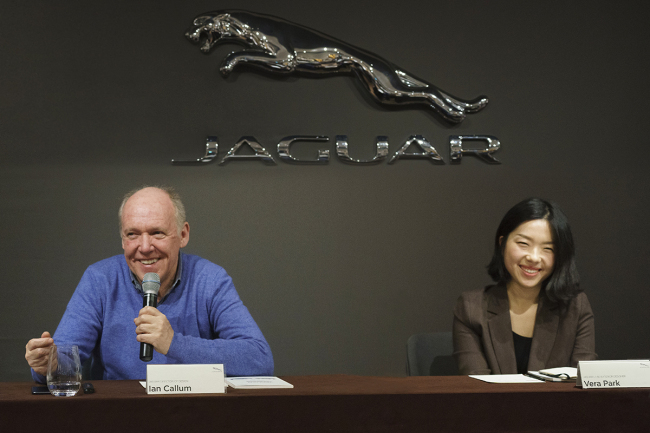 Sharing his thoughts about the role of design in future mobility, legendary car designer with Jaguar Ian Callum said Wednesday that Jaguar’s driverless cars will be equipped with steering wheels, while acknowledging the silhouette of cars in general will undergo change. “I think it will be a long time before you see an autonomous car from Jaguar without a steering wheel. For the time being we are focusing on various levels of autonomy that still include driver interaction if they choose to do so, because Jaguar is fundamentally about driving,” said Callum, Jaguar’s design director, at a press conference at the Grand Hyatt Hotel in central Seoul. The number of autonomous vehicles worldwide will increase 40-fold from 390,000 units in 2022 to 16.8 million units in 2030, according to Boston Consulting Group estimates. Callum, who joined Jaguar in 1999, is credited for designing the brand’s iconic and top-selling lineups with a new design language, including the current XF and XJ sedans, the premium sports sedan XE, the F-TYPE luxury sports car and the brand’s first sport utility vehicle, the F-PACE, to name a few. Prior to Jaguar, the Scottish designer worked at Ford, TWR and Aston Martin. His Seoul trip is intended to evaluate final contenders in Jaguar’s third car design contest and attend the awards ceremony later this week. The annual event is Jaguar Korea’s corporate social responsibility initiative, organized since 2016 to recognize talented Korean undergrad and grad students. The I-Pace is Jaguar’s new high-performance battery-powered sport utility vehicle, with a 480-kilometer driving range. It is scheduled to be launched here in the first half of 2019, according to the company. To discover future talent and a shape for the Jaguar XJ, the task for this year’s contest was to design the Jaguar XJ for 2068. Jaguar XJ is the name of the series of full-size luxury cars the brand introduced in 1968. Asked for advice for young designers, Callum recommended engaging in different fields of interest to bring together various factors of design. “Understand as well as you can other areas of creativity whether it’d be the art, the science, engineering, whatever it might be. I think the real future of the design will be an amalgamation of different functions and different disciplines creating fresh new ideas,” he said. Out of 129 pieces contending, three teams will be crowned at the ceremony later this week. They will each take home 2 million won in prizes and enjoy a tour of London, plus the chance to benefit from an in-person session with Callum and have their portfolios reviewed by global Jaguar design team, the company said.